Above is a Snow Traveller from Barrie G in Arundel, Quebec. 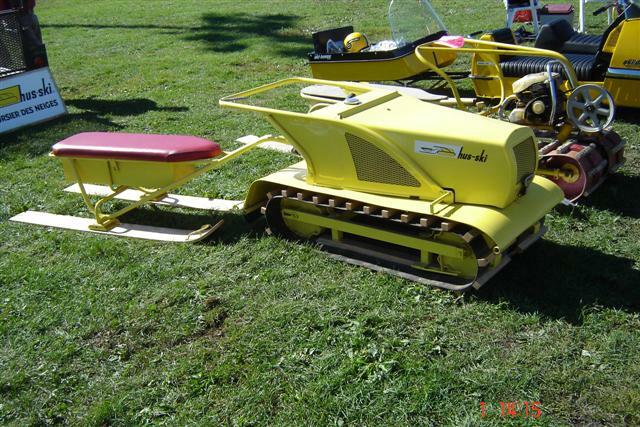 This was the first model produced by Hus Ski from their original plant in Hespler, Ontario. This machine was the 34th produced in 1962. Below is an article Barrie wrote for Snowriderswest.com. 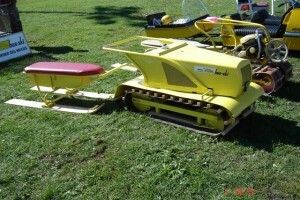 Having completed several years of prototype testing, the McOuats were ready to start production of their snow machine. They set up a production facility in Hespler, Ontario with Bob Anderson as production manager. It was in this facility that they produced their first Snow Travellers. Track belting on the Snow Traveller was 4″ wide while the cleats were 1″ x 1″ x 10″. There was no headlight or braking system. The ski seater had a straight pipe design whereby the familiar bend under the seat was not there. The skiis measured 60″ x 6″ x 5/8″. The skiis were made by a water ski manufacturer in Quebec. The aluminum drive cogs and other cast aluminum parts were sand cast in Ste. Eustache , Quebec. Dealer signs were made by “Barker”. These signs were made of tin and had the raised lettering “HUS-SKI SNOW TRAVELLER” in black print on a white background. None of these signs are ever discovered outside on signposts or buildings. Although I don’t know it for fact, it is a sound presumption that because Polaris was already using the Snow Traveller name, Hus-Ski had to drop the name and become known simply as “Hus-Ski”. The signs remained unused.